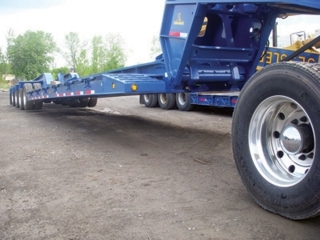 Albion, PA — ROGERS® more than 100 years of successful trailer design and manufacturing is directly linked to their ability to anticipate the changing demands of the hauling industry. Their new CobraNeck multi-ride height detachable gooseneck is an optional neck designed to make unhooking and delivering safer, faster and more convenient for today's drivers. It allows increased ground clearance, when necessary, while saving time that would be spent in changing ride height settings. The CobraNeck is currently available on all ROGERS' 55-ton and larger detachable gooseneck trailers. ROGERS® new CobraNeck provides maximum lift!